Time for another recipe (the 5th in a baker’s dozen). This is another that goes great with tea. Be adventurous and give her recipe a try with a pot of the tea named and assess the pairing for yourself. These are vegetarian/vegan-friendly (just omit the cheese) and quite delicious. And, according to the cook, they’re made from leftovers. You know, that stuff your generally leave in the back of the refrigerator for a few days… weeks… months… uh, actually, how long has this stuff been in there? Well, her leftovers weren’t that old and weren’t quite the same as those leftovers from the neighborhood Chinese restaurant. They also made up a tasty and quick dish to satisfy her hunger. It pays to know what to do with some large white mushrooms, extra-virgin olive oil, garlic, fresh baby spinach, lemon Juice, panko bread crumbs, and grated Parmesan cheese. And if you have some sea salt and freshly ground black pepper, you can add that perfect taste accent. Some of us would just stare at this stuff and order a pizza. But not her! She whips up a meal fit to go with a tasty Indian tea. Nilgiri tea comes from the Nilgiri region of India. 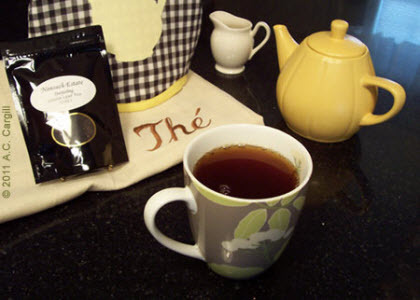 The Nonsuch Estate conveys the typical qualities of this type of tea. Hubby and I tried it a couple of different ways. A 2-minute steeping was light, fruity, and needed no additives — a great tea break for those who like their tea straight. A 5-minute steeping was more similar to a nice Assam tea, with a dark amber color, a malty aroma, and a taste that endured even with a bit of milk added — perfect for those who like milk in their tea and a stronger taste. I like the 2-minute steeping method with this dish, but you might want the lighter flavor of the 5-minute steeping method. Hope this works for you. Feel free to comment here with your experience, and watch for the next pairing to be posted in September.